This collection consists of three sections as follows: Diplomas and Academic Certificates issued by the University of Pennsylvania, 1757-1971 (11.5 cases); Miscellaneous Certificates issued by the University or University-related institutions, 1819-1975 (2 cases); Diplomas, 1799-1964, and various certificates, 1787-1974, issued by Non Penn-related institutions, (6 cases). Diplomas issued by various schools of the University of Pennsylvania, 1757-1971, are chronologically arranged by the date of graduation or the date a certificate of school attendance was issued and the remaining three sections are all alphabetically arranged by the name of the recipient’s last name. 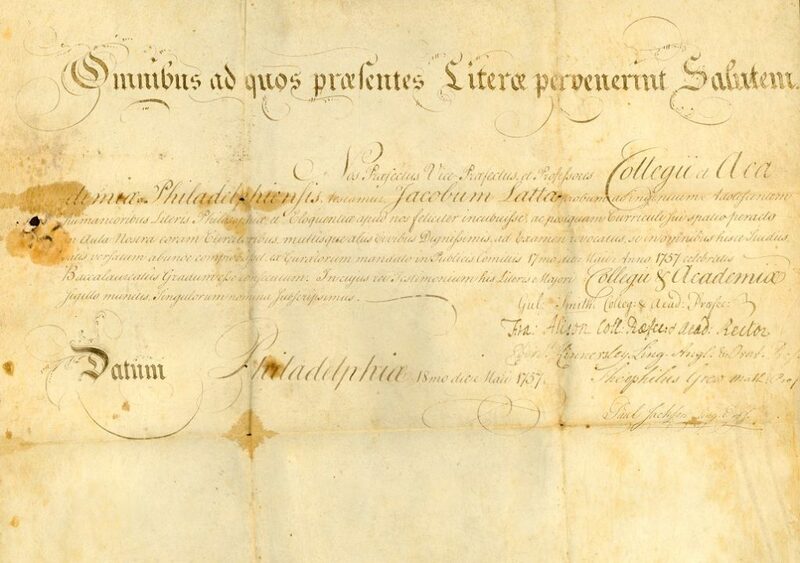 The material utilized for Penn diplomas used to be sheepskin parchment. In World War II, due to the shortage of the supply of appropriate sheepskin, paper parchment was used for some diplomas. This change gave rise to a debate on campus in early 1950. The following are a few passages taken from the journals at the time. University diplomas will be printed on paper parchment this year, Secretary of the University Donald K. Angell, announced yesterday. According to the E. A. Wright Company which is the diploma engraver for both Penn and Temple University, all Temple diplomas will be of the sheepskin variety, and the sheepskin material is ready for use if the University wishes its diplomas to be printed on such material. When questioned on the Wright Company statement, Mr. Angell refused to comment. He did say, however, at a previous interview, that the issuance of both paper and parchment scrolls is not a new development and that such Ivy League schools as Princeton, Columbia, and Cornell have also sanctioned the awarding of the parchment diploma. Despite the fact that leading diploma engravers in Philadelphia claim that sheepskin is available for university diplomas, Donald K. Angell, Secretary of the University, reiterated yesterday that the cheaper paper parchment diplomas will be distributed to the June graduates. Angell said that approximately 1300 diplomas, going to the undergraduate members of the class of ’50, will be made of paper parchment, while 900, distributed to professional school graduates, will be of the sheepskin variety. Last year’s notice also contained the statement that the paper parchment material was better for use in diplomas than the traditional sheepskin. This contention was refuted by such engraving companies as the E.A. Wright Company of Broad St., and the Charles H. Elliot Company on Lehigh Ave. Both companies contended that diplomas made of the paper parchment material was of an inferior quality to those made of sheepskin. It was also learned from these companies that the price for the sheepskin diplomas was higher than the price for diplomas made of paper parchment. “An editorial in the May 2, 1950, issue of The Daily Pennsylvanian states that it feels that an honest and forthright explanation by the administration on the subject is in order. If there is interest in this subject, certainly such a statement should be made. “Some years ago, due to conditions resulting from World War II, it became impossible for the University to obtain sheepskin parchment diplomas in sufficient quantity to supply one for each graduate. As a result, some diplomas were engraved in paper parchment, which our supplier, the E.A. Wright Company, warranted to be actually superior to the sheepskin diplomas in resistance to shrinkage, corrugation, and age discoloration. In the intervening years, each graduate receiving one of the paper parchment diplomas has been given at the same time a notice setting forth these facts and stating that on request and without charge the University would supply in place thereof a new diploma prepared on sheepskin parchment at such time as the latter material became available. Only forty graduates made such requests in the past year and all these requests have been filled. “Other institutions which customarily awarded sheepskin diplomas adopted similar procedures. Several issued only diplomas engraved on paper. Our supplier reports that the diplomas issued by Dartmouth College, Ohio State University, The University of Wisconsin, Cornell University, and Columbia University are engraved on paper parchment. Some of these have used paper diplomas for many years. Others which previously used sheepskin parchment have concluded that the paper parchment is superior. The difference in cost is only 90 cents and is not a controlling factor. “A large part of the supply of sheepskin parchment currently available, while unquestionably genuine sheepskin, is of inferior quality and not suitable for satisfactory first-class diploma engraving. The section of Diplomas issued by the University of Pennsylvania, 1757-1971, includes course attendance certificates issued by various schools of the University. The Miscellaneous Certificates issued by the University or University-related institutions include awards, membership certificates of various Penn student or alumni societies, and other certificates and citations issued by Penn or Penn-related organizations. Diplomas and certificates issued by Non Penn-related institutions are also divided into two sections–diplomas including academic certificates; and miscellaneous certificates. The recipients of these diplomas or certificates may or may not have been related to the University of Pennsylvania. This collection also includes a “Calligrapher’s File,” which consists of blank Penn diplomas of the nineteenth century, various sample citations (originals or photocopies) of the University and other institutions in Latin or English, and practice sheets of L.L.D. awarded to General John Joseph Pershing in 1922. Landis, Eugene Markey Penn Oliver Memorial Prize in ophthalmology n.d.